The Google Play Developer account is what gives you the ability to make your app available on the Play Store for Android users. Due to Google’s guidelines and policies, you are required to setup your own developer account for your app to be published. The good news, however, is that because the app will exist under your account, you will have more control over it and it will maintain your business' branding on the Google Play Store listing. Before creating your Google Play Developer Account, we suggest upgrading your account. You can do so by clicking on the green Upgrade button in the top right-hand corner. Before upgrading, the Publishing Info page was only a single text box. Now the rest of your Publishing Info page should be populated, including the Android Specific Publishing Information. 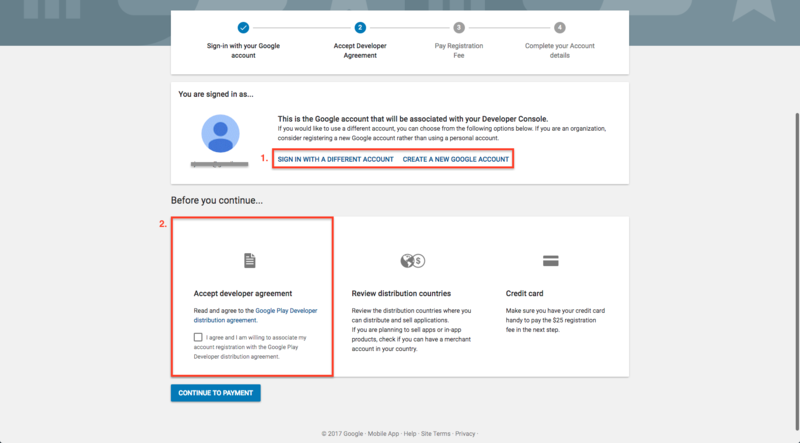 Step 3: Click on the link to open a new Google Play Developer account. Make sure the account shown here is the one that you’d like to use to sign up for the Google Play Developer account. This email will be the one linked to your account and receive updates on your app, so make sure that it is the correct one. If this app is tied to an organization, we highly recommend that you use an email associated with that organization and not your personal account. Be sure to read Google’s distribution agreement document and then check the box in order to move forward. Step 6: Enter your credit card information to pay the one-time $25 signup fee. Then click Continue Registration to finish up your Payment and continue to your Google account. VERY IMPORTANT: Do not use our publishing email as the email address or any variation of our company name as your Developer name. You’ve now successfully created a Google Play Developer account! Please note that it may take Google up to 48 hours to process your payment. 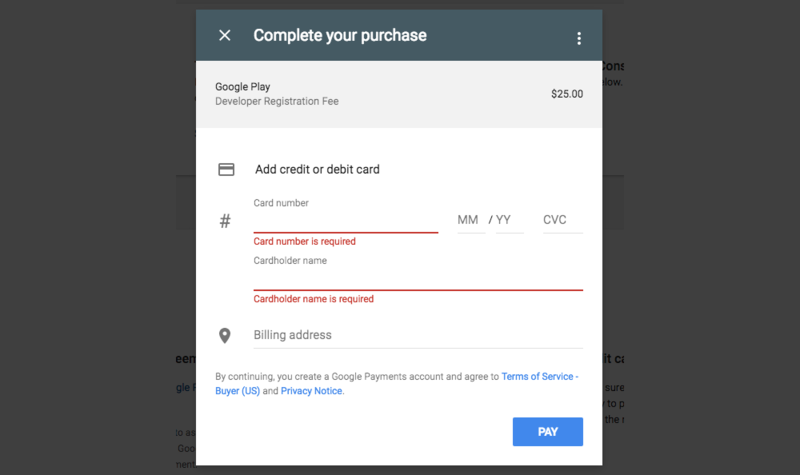 Until Google has processed your payment, then we will be unable to publish your app. In order for us to publish your app, you’ll need to add us to your account. To learn about how to add our Publishing team to your Google Play Developer account, check out our article on how to do that under “What are some related articles?” below. A Google Play Developer account is only a one time charge of $25*, but you can have as many apps as you'd like for your particular business under that account as long as they adhere to Google's terms. *According to Google, this price is subject to change at any time and may include taxes where applicable.